OK – if you aren’t already fed up with babyproofing, you probably will be soon! We know it’s annoying, but hang in there – it’s totally worth it. 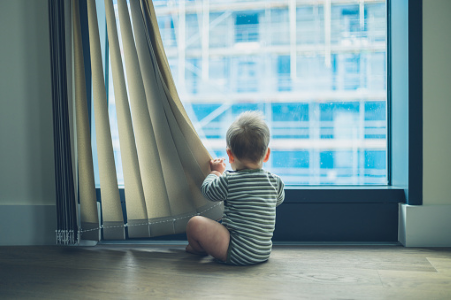 In 2011, Pediatrics (the official journal of the American Academy of Pediatrics) published one of the first ever studies on window fall injuries in the United States. It paints a scary picture…between 1990 and 2008, more than 98,400 children visited an emergency department with an injury from a window fall (that’s more than 5,000 per year). A full quarter of those kids were injured badly enough that they were admitted to the hospital. *Nearly 65% of injuries occurred in the 0-4 age group, with the most common ages being 1-year-olds and 2-year-olds. Compared to older kids, younger kids were more likely to suffer head injuries, more severe injuries, and death. Toddlers and preschool-aged kids have the highest likelihood of falling from a window and getting (seriously) hurt. The biggest hazards lie within old homes/buildings. You see, modern buildings typically have much safer windows than old buildings. For example, in modern mid- and high-rises, the windows are limited to opening 3”. The scary ones are the old Victorians, for example, with windows that come all the way down to your knees and open up to the size of an adult. For people who have these old (beautiful!) double hung windows (assuming they aren’t painted shut…. ), your best bet is to open the top sash only. Yes, many people don’t know this, but true double hung windows can open from the top or bottom — and opening them from the top (only) is an easy way to solve this babyproofing problem. A similar study that looked at window cord-related injuries found that they are less common than falls, but still a major problem – from 1990-2015, nearly 17,000 children under the age of 6 visited an emergency room due to an incident with window blinds (around 650 per year). Most of the cases involving window cords – which pose a major risk for strangulation – were lethal. The CPSC just passed a new mandate requiring that window coverings be cordless (by the end of 2018), but it will take years for this new regulation to really “take effect,” since there are countless corded window coverings in homes and other buildings across the country. The takeaway: window safety is serious business. This might be the easiest route to go, especially if you have a newer home with windows that latch/lock closed. If you don’t, you can get simple locks – like this sash lock – from your local hardware store. This (obviously) entails keeping your windows closed at all times, and that’s certainly not going to work for everyone (looking at you, west coasters-who-have-no-A/C…). Yes, the kind that look like jail bars. It might not be the exact aesthetic you were going for, but these add-ons work. The AAP, the CPSC, and worried parents everywhere endorse and encourage them. If you want to be able to throw your windows open and let the summer breeze sweep through your home, this is definitely your best option. It’s possible to find them at your local hardware store, but you’re probably better off getting some online. Check out Guardian Angel Window Guards for a buying guide to see what kind/size prison bars you need (kidding! Sort of). You can also order them on Amazon, if you prefer. Proper window guards will all have emergency releases for firefighters (little buttons that firefighters know about! ), so you don’t have to worry about creating a deathtrap. You should learn how to use these as well — it’s quite simple (for adults, not for kids). If you “DIY” it, make sure the gaps between bars are no larger than four inches wide. Lastly, some parents advise putting these in “sideways,” so the bars are vertical, to prevent expert climbers from scaling them like a ladder. If you’re dead-set against baby jail, KidCo makes a mesh window guard that parents seem to like pretty well. One reviewer described the mesh as about the same material as a pack ‘n’ play, if that helps give you a sense of how protective it would be (…if you’re nervous at all, probably better off with the bars). A few users also warn that the screws strip very easily, so watch out for that during assembly. It fits windows 26-40” wide. There are a couple of different kinds of window stoppers, but they all basically limit the distance a window can open. Hence, this is a great option for opening the windows just a little bit – four inches at most. —then you can get a separate type of window stopper. The downsides with these more powerful restrictors are that 1) they can be tough to find (definitely check your local hardware store), and 2) they require screws for installation. (Note: local window companies often also have this kind of “specialty hardware,” so that’s another place to check.) Some people also use a simple chain lock to achieve the same effect. **DIY hack: if you have adjacent windows, you can tie them together so they’ll only open so far. If you have a Juliet door (a la Peter Pan) that you need to lock up, you may need actual locks — head on over to doorknob covers to see our picks for door locks. Another option is to install something heavy-duty, like a deadbolt. Using a FREE kit provided by the Window Safety Council – request one here. *Note: parents aren’t crazy about either of these two products (they’re cheap), but the cord wraps seem to hold up a little better. Move furniture away from windows (there are more accidents when furniture is near a window). Remove the cranks from crank-open windows to keep kids from opening them. If you want the extra insurance, some parents like to use window alarms just in case — these sound an alarm if the window opens at all (or opens past a certain point). Either way, if your kiddo did manage to get a window pried open, it would alert you immediately. We like the Doberman Security Window Alarm Kit ($10 for 4 or $30 for 12). ***Do not rely on screens to keep your child from falling out a window. Screens are designed to keep BUGS out – not kids. Boys are more likely to suffer window-related injuries. They just are. If you live in an apartment, your landlord might be required to provide window guards, so you may want to check local ordinances…. Some local/state public health departments provide window guards at a discounted rate (ahem, Boston…way to go! ), so that’s worth two minutes on Google. 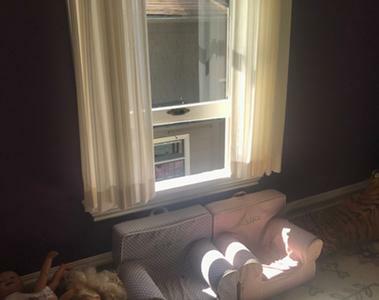 Windows can be a major hazard for little kids — installing guards is a total headache, I know, but you will sleep (or do whatever else you’re doing) so much better knowing you don’t need to worry about them. Plus, childproofing to the nines is one of our discipline commandments to improve toddler behavior [link coming soon!] — win, win. “Childproofing Windows & Cabinets.” Cleveland Clinic. Accessed March 13, 2018. https://my.clevelandclinic.org/health/articles/9038-cabinet–window-locks. “Childproofing Your Home- 12 Safety Devices To Protect Your Children.” CPSC.gov, January 8, 2016. https://www.cpsc.gov/safety-education/safety-guides/kids-and-babies/childproofing-your-home-12-safety-devices-protect. Harris, Vaughn A., Lynne M. Rochette, and Gary A. Smith. “Pediatric Injuries Attributable to Falls From Windows in the United States in 1990–2008.” Pediatrics 128, no. 3 (September 1, 2011): 455–62. https://doi.org/10.1542/peds.2010-2687. “How to Childproof Your Windows | OnSafety.” Accessed March 13, 2018. https://onsafety.cpsc.gov/blog/2010/04/09/how-to-child-proof-your-windows/. ““Kids Can’t Fly: Window Safety for Warmer Weather” | Mass Public Health Blog.” Accessed March 13, 2018. https://blog.mass.gov/publichealth/ask-mass-wic/kids-cant-fly-window-safety-for-warmer-weather/. Onders, Bridget, Eun Hye Kim, Thitphalak Chounthirath, Nichole L. Hodges, and Gary A. Smith. “Pediatric Injuries Related to Window Blinds, Shades, and Cords.” Pediatrics 141, no. 1 (January 1, 2018): e20172359. https://doi.org/10.1542/peds.2017-2359. “Window Blind Cords Still Pose A Deadly Risk To Children.” NPR.org. Accessed March 14, 2018. https://www.npr.org/sections/health-shots/2017/12/11/569463027/window-blind-cords-still-pose-a-deadly-risk-to-children.